You can have no milk, skimmed or normal milk, but you must choose one and one only possibility. I'd avoid option buttons like the plague: a combo box is easier to create, and makes it much easier to add additional options that you've forgotten (semi-skimmed milk, anyone?). 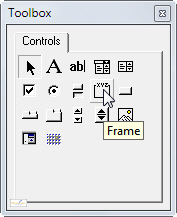 I've only included this page because some clients or managers will ask for option buttons! 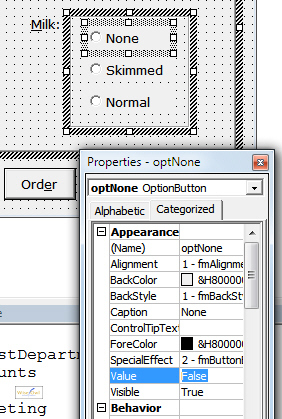 Here the OptNone option button has a value of False initially. As soon as you select None as your milk choice - and thereby set the value of OptNone to True - the value of the other option buttons in the frame will automatically be set to False. 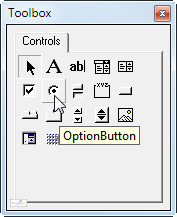 It's a good idea to rename your option buttons once you've added them: I've called the ones above OptNone, OptSkimmed and OptNormal. Select the option buttons to change their GroupName property (or you can set it for each button individually). 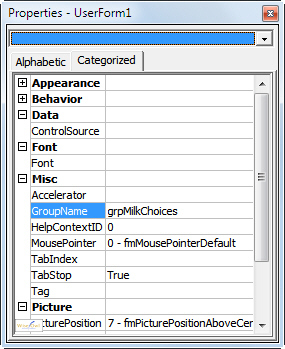 Type in a value for the GroupName property (here we've set it to grpMilkChoices). Because no other option buttons use the same group name, the buttons will automatically now cancel each other when clicked. There's no great advantage that I can think of to using a frame or using grouped buttons - maybe it's down to personal preference! Adding another option button is not only going to mess up the form, but also require more lines of code. Like I say - combo boxes are easier!